Mark Zuckerberg has just spoken at the TechCrunch Disrupt Conference in San Francisco with TechCrunch Founder, Mike Arrington. This is the first time he has really spoken since the IPO and has given the audience some insight into the companies current standing. – Mark acknowledges that the drop in share price is disappointing and that “Facebook does care about it’s investors and shareholders”. – Since the latest Facebook iOS app update, engagement has doubled, users are visiting Facebook Mobile much more, and all the metrics are moving in the right direction. – Mark Zuckerberg believes Facebook can make more money from it’s mobile platform than from desktop ads. 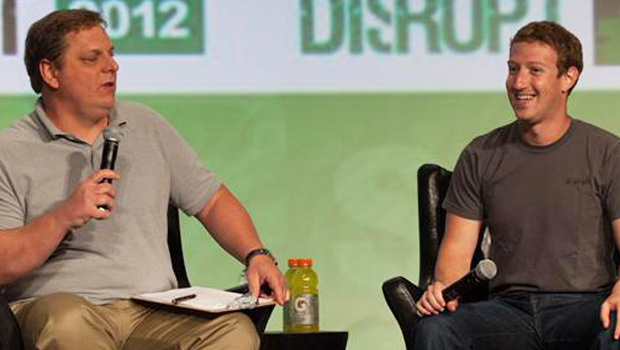 – Facebook originally bet big on HTML5 with their mobile apps. This didn’t take off as they wanted to have gone to build native apps for the major mobile operating systems. This put Facebook “2 years behind” in the development cycle. – Facebook wants to keep Instagram as a seperate product and doesn’t see the need to move them across to Facebook’s technology platform and stack. Since Mark Zuckerberg went on stage, it seems to have restored some confidence with commentators and the stock price has risen considerably in a matter of minutes (up 4.6% in after hours trading).